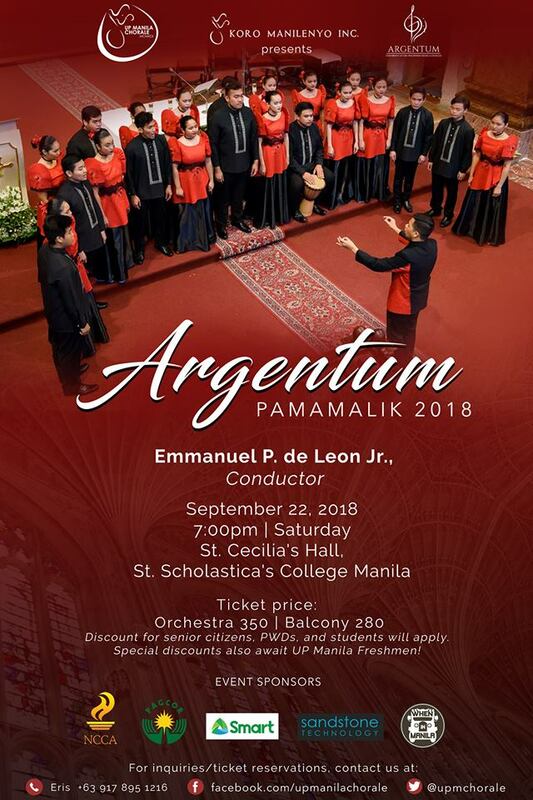 "As we close our year-long 25th anniversary celebration, we invite you to ARGENTUM: PAMAMALIK 2018, UP Manila Chorale's 9th European Tour Homecoming Concert! Allow us to serenade you with music from our 9th European Tour this September 22, 7:00PM, at St. Cecilia's Hall, St. Scholastica's College, Manila. Tickets are at P350 and P280 for Orchestra and Balcony seats, respectively. Discounts for students, senior citizens, and PWDs will apply. Special discounts also await UP Manila freshies! For inquiries and ticket reservations, send us a message at our social media accounts or text us at +63 917 895 1216. Join us as we wrap up our 25th year anniversary celebration and continue our journey towards choral excellence! See you there!"